So today, I'm going to look at a couple of the cycles as well as the planeswalkers for Theros. 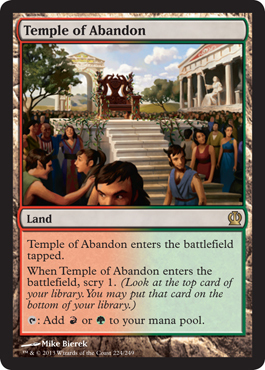 So here we have the Scry Lands. We get the Gatecrash oriented ones as this way RTR and Gatecrash color sets have lands existing for about the same amount of time as each other... It just equalizes things a bit. But there are many complaints about these, such as how they are glorified guildgates. Or how you should be able to scry for more than just one. Okay, so on one hand, we do have the guildgates at common coming in tapped and tapping for one of two colors, which these do that but with Scry 1. Alright, so looking at that, they should either be Scry 2 or uncommon. On the other hand, guildgates are needed to mana fix for the multicolored cards in the RTR block and was the replacement for the bounce/karoo lands from the original Ravnica block. Since the guildgates are for mana fixing, then they need to have at least one in each booster, or something close to that, so they would need to be at common level to satisfy mana fixing in sealed and in draft. Otherwise, they would probably be uncommon. 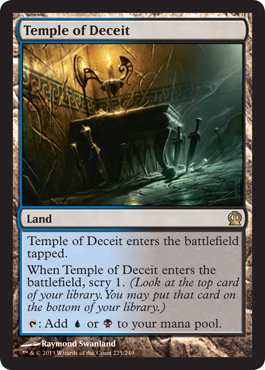 So because New Benalia exists at uncommon tapping for just white and having Scry 1 is why the Scry Lands are at rare: Because they are dual lands. Could they be better? Sure. They could be Scry 2. Does it slow down the game as is? Sure. Will the price go up? You know, they are valued by Star City Games at $6 right now. I could see them maybe going to $10. 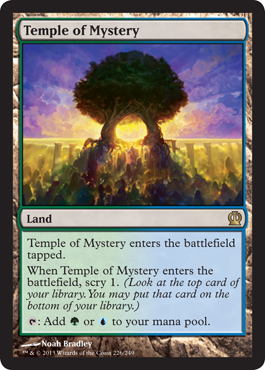 I could be wrong, but people will wind up using them, and by the time the RTR block cycles out, these will be the main dual land available, assuming we get more in the next block and/or in M15. These are just plain awesome! So they are legendary, enchantments, and creatures of type God. You cast them for their normal cost, but it depends on your devotion to a color as to whether or not they are enchantments or creatures. They also have two abilities, one being an ability for just having them, and the other is a mana ability. And did I mention that they are all indestructible? Let's check out Heliod first. 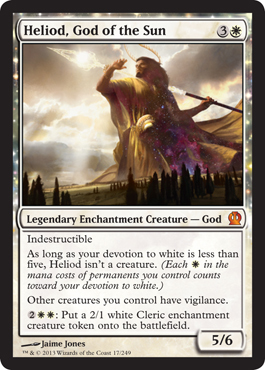 All your other creatures will have vigilance, and for four mana, you will get a 2/1 Cleric enchantment creature. That's okay. Helps out token decks, but that's about it. Next is Thassa. At the beginning of your upkeep, you get to Scry 1. And her mana ability, for just two mana, a creature you control is unblockable. 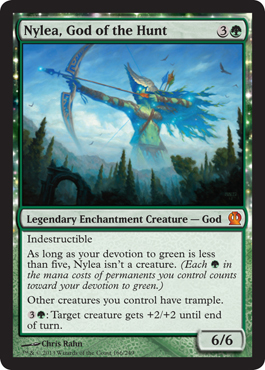 That's just fun... You could just pump up Thassa with enchantments and make her unblockable... Easy to win, and a great card for Commander. 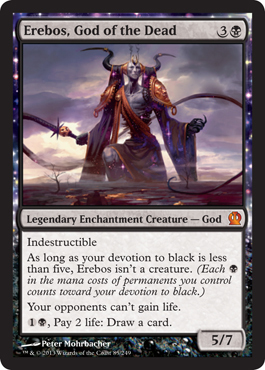 Now for Erebos. Your opponents can't gain life is his first ability. That's great, for starters. Then for two mana, you can pay two life to draw a card. Not bad... Gives you an advantage and shuts down anyone with Sphinx's Revelation or Archangel of Thune. Now Purphoros. So when a creature enters the battlefield under your control, he deals two damage to each opponent you have. And for three mana, all creatures you control get +1/+0. Definitely a great one. He can help most token decks and any creature heavy decks. Also great for Commander. And last, but not least, Nylea. Other creatures you have get trample, and then for just four mana, target creature you control gets +2/+2. 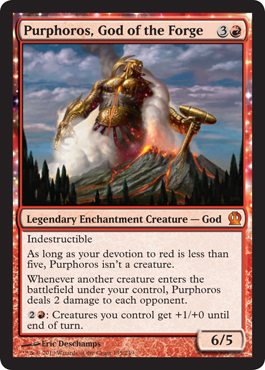 Strictly speaking, Purphoros's mana ability is better as for three all creatures get +1/+0 versus just one creature getting +2/+2, but Purphoros lacks the toughness factor. 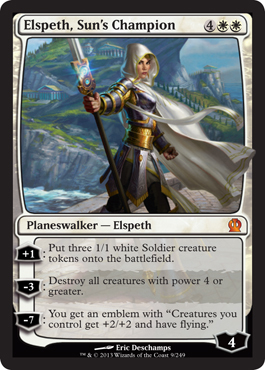 Elspeth, Sun's Champion is awesome and works in token decks, first and foremost. 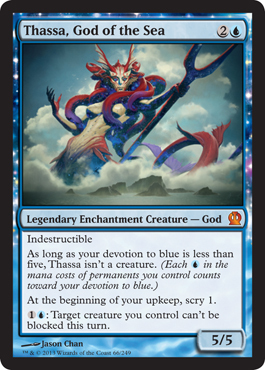 She also shuts down decks with large creatures (like Kalonian Hydra and any deck with Archangel of Thune) using her second ability. And lastly, she pumps up any tokens and all of your other creatures by giving them all +2/+2 and flying. 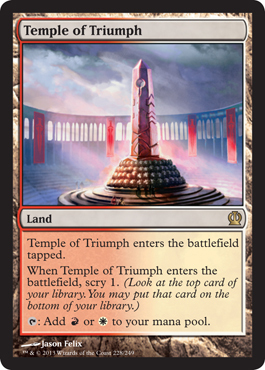 I can see her showing up in any deck running green and/or red along with white (so Boros, Selesnya, or Naya). She will possibly go up in price given all that she is good for. Ashiok, Nightmare Weaver is good in the sense that he helps with milling an opponent. Granted the cards are exiled and not put into a graveyard, but at the same time, you can then take exiled creatures and play them using his -X ability, which could improve your side by putting some awesome card you exiled under your control without having to change colors. And the last ability could also be used in conjunction with his second ability by exiling the hand and graveyard, and then putting another card onto the field under your control. He's hard to manage and protect, but he is also only three mana, so in the early game, you may not have to worry about defending him too much. Definitely an EDH card to fit with the Mimeoplasm, I think. 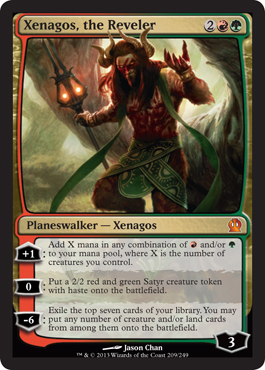 Xenagos, the Reveler is really awesome and is going to see a lot of play in decks that already have Domri Rade. He already can add mana in any combination of red and/or green to your mana pool dependant on the number of creatures you have. You also have his second, or zero, ability allowing a 2/2 creature token with haste to enter the battlefield to protect him or count for mana on the next turn, and then on top of all that, his last ability allows you to exile the top seven cards and put all creatures and lands onto the battlefield. This is already amazing, and his price has already gone up from when he was revealed. He'll probably stay high in price for a while, especially knowing the fact that he is great, not just in Standard, but other formats too.